Chef Sharon Hage Closes York Street, Dallas. Old news by now – every local food lover was left reeling by the abrupt closure of what many considered the best restaurant in town. Along with the continually brilliant Tei-An, York Street was always a place to take visiting food connoisseurs – and at the top of any list of recommendations to locals. I enjoyed many meals here, but lament not going more often. Sharon's passion and respect for quality ingredients and her honest, strait-forward preparation made this little restaurant a true gem. Here are some memories of York Street – from meals that I have previously not posted. The turkey has done come to roost. 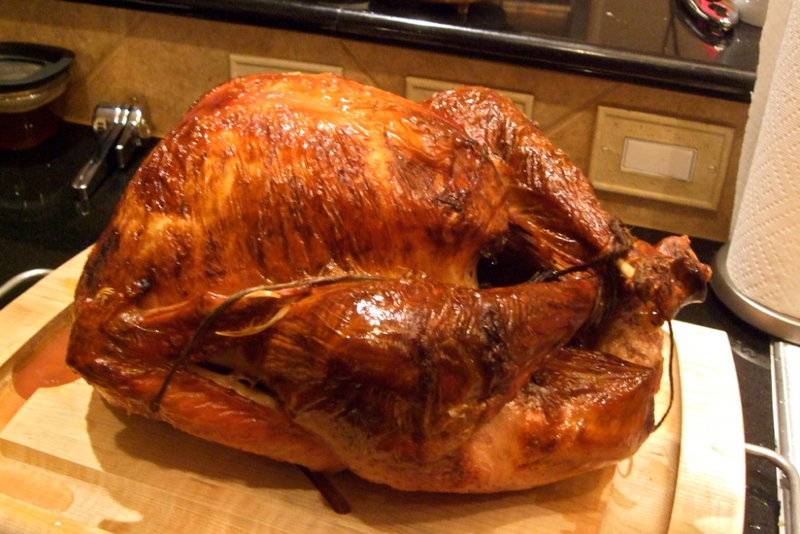 Here is my 2010 Thanksgiving round-up. As many people do, I had a split holiday this year. One of my brothers (the one from LA) came home this time – so we had Thanksgiving early at our mom's, then we did a late dinner for our dad at my place. The original plan was to do my thing to Mom's turkey at her house, then take Dad out to dinner later – but I found myself at Central Market early enough last Wednesday – and I just couldn't help myself. 45 mins later it was clear that I was doing 2 turkeys. Luckily, Mom had all her famous sides under control – so all I had to do was show up and inject, then monitor the roasting with my bro – who is also a devotee of my process. 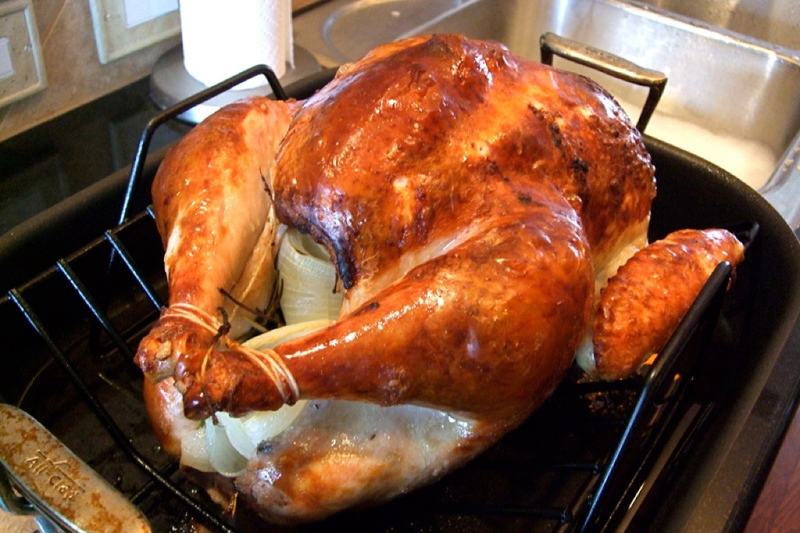 Mom is happy enough to relinquish turkey duty to her sons, having enjoyed the results these last five years or so. All went to plan – the perfect bird was achieved, and enjoyed by all. Five hours later, we did it all again! 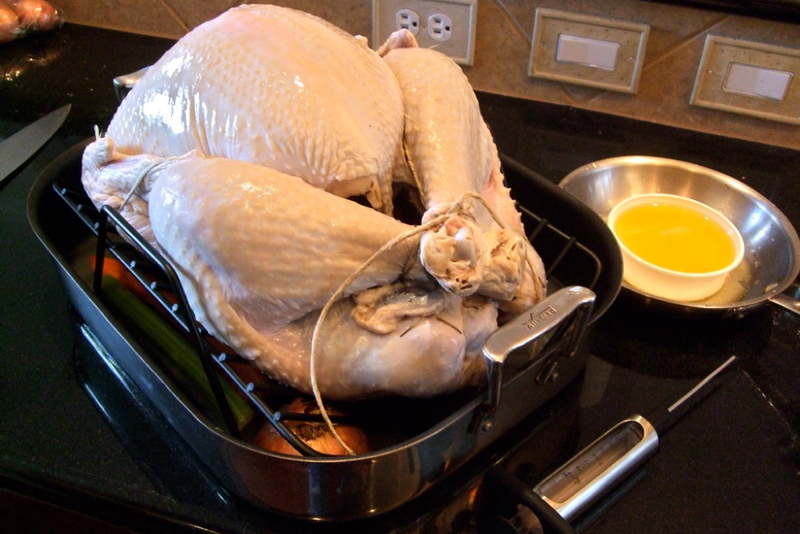 ^ The Free Range Turkey – brined overnight; ^ Patted down, with the aromatics ready. 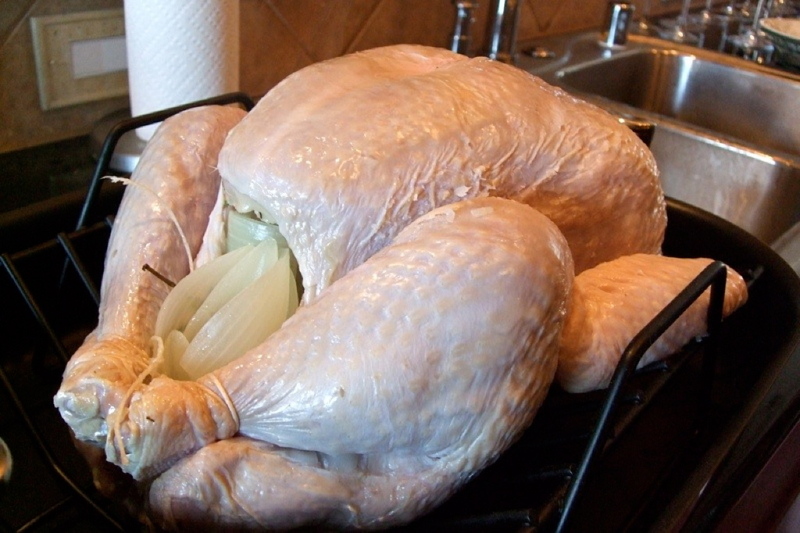 ^ Plumped up and ready to go; ^ and after the first 30 mins at 500°. 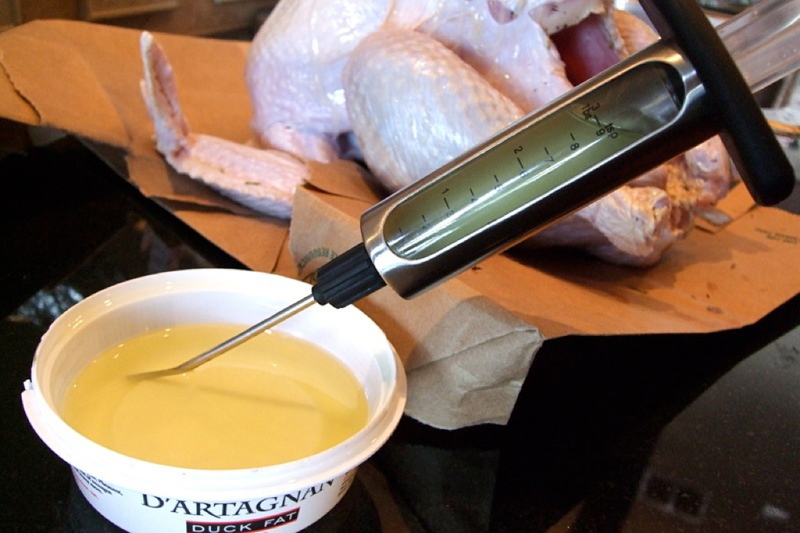 ^ The disturbingly decadent Turkey/Duck Fat drippings; and the resulting gravy. ^ Yes – perfect. 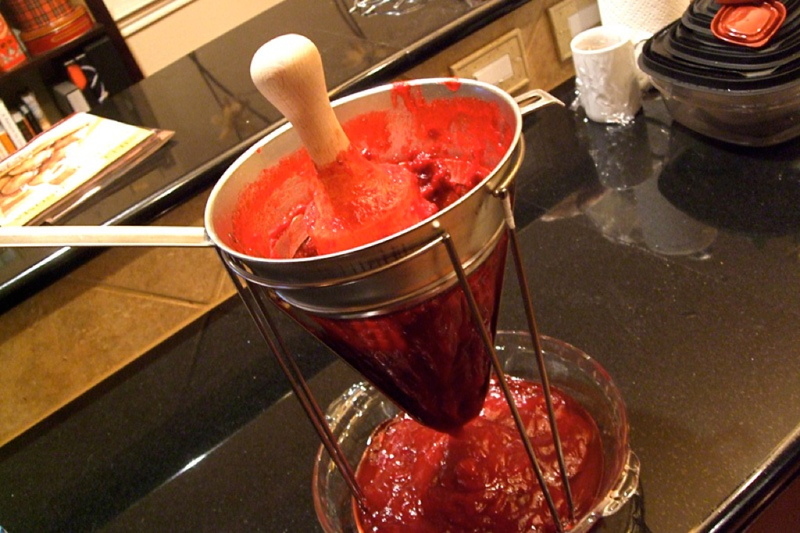 The meat literally gushes…! ^ …and this is what it's all about. Food is love, my friends. The Happiest of Holidays to you all! Here it is! 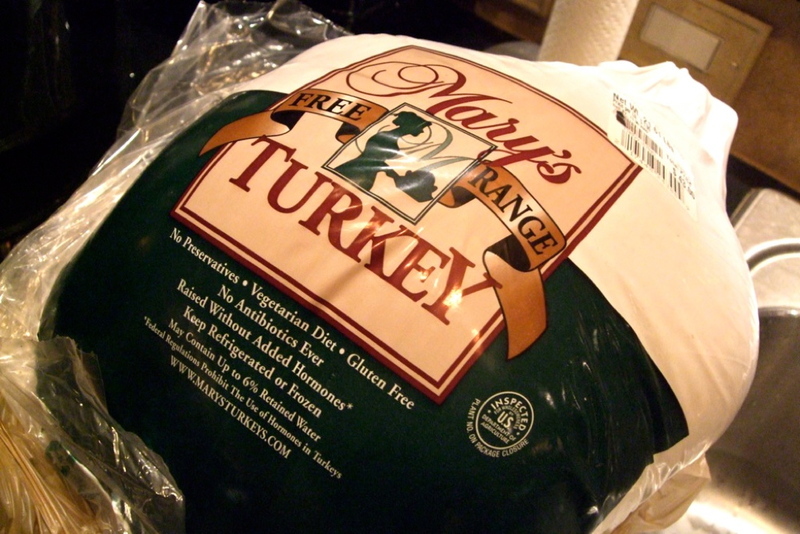 The yearly posting of my Perfect Turkey Post! 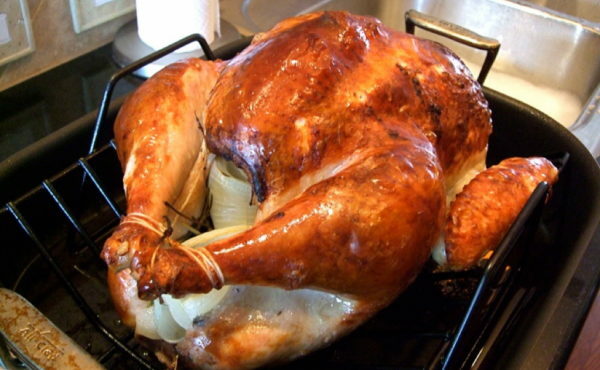 You see, most everyone who has tasted my holiday turkey agrees that it pretty much is the best thing going. So you’ll have to take note now, as I will probably be mean and take it down before next Thanksgiving – because, frankly, I don’t need the competition. You may find the following disturbing – but these are the waters. You have been warned. 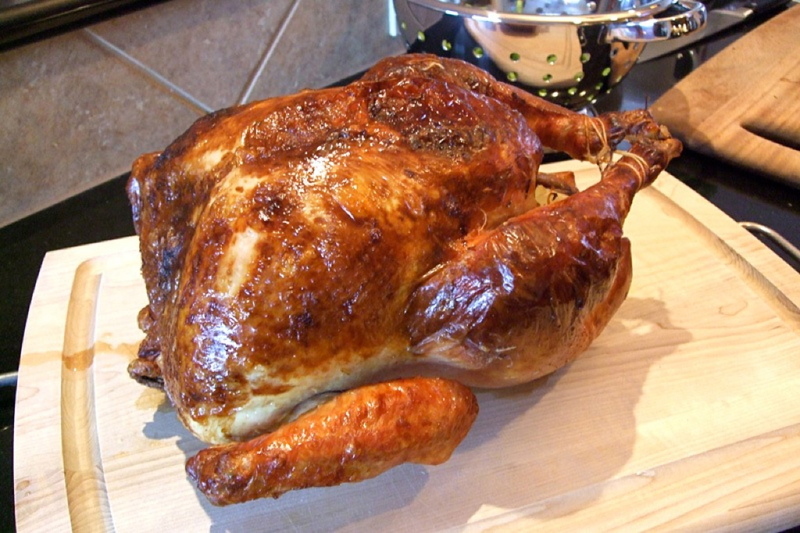 ^ Why not start with a fresh Free Range bird? Often, I order a Willie Bird through Williams-Sonoma – but in a pinch you can find one at any decent market. 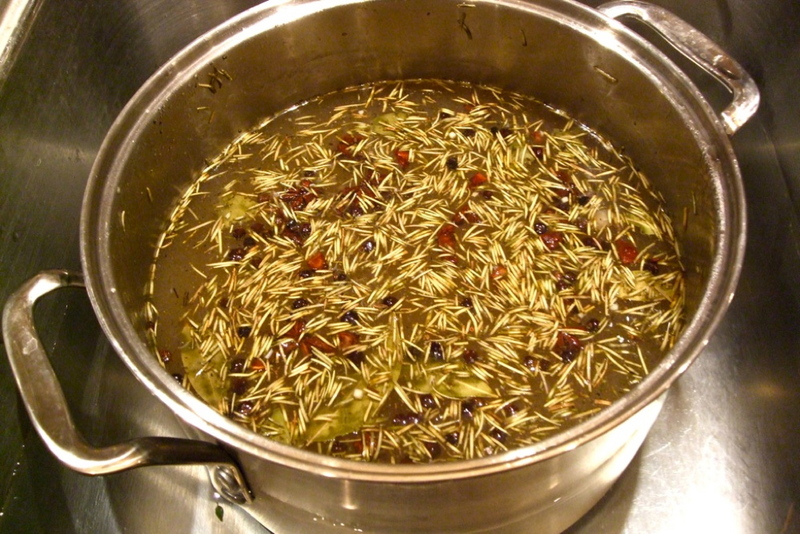 Meanwhile… I refuse to debate – so brine. I always buy the Williams-Sonoma Brine-of-the-Year – it’s my own holiday tradition and always just lovely – for $16-$18. 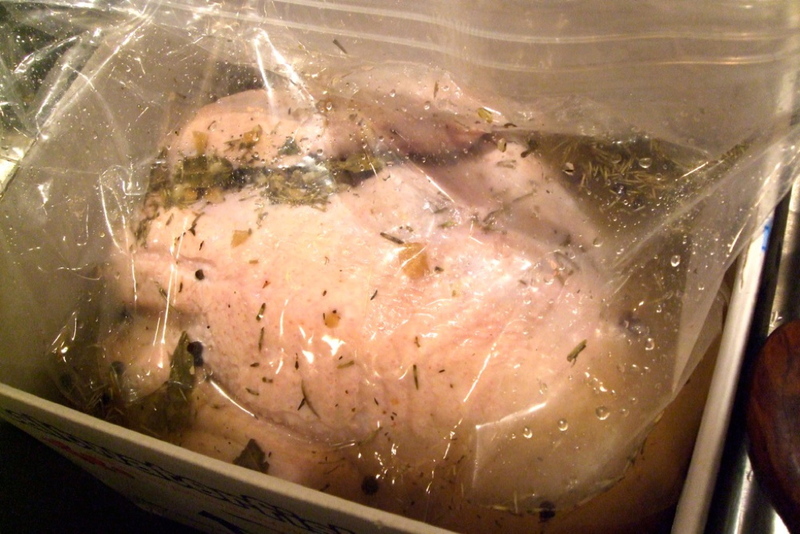 ^ The bird in the brine after 12 hours; ^ and NOW: The Terrible Secret. That’s right, get a tub of DUCK FAT. I heat the tub gently in warm water until it turns to liquid. (Locally you can find duck fat in the deli section at Central Market, in very limited supply). 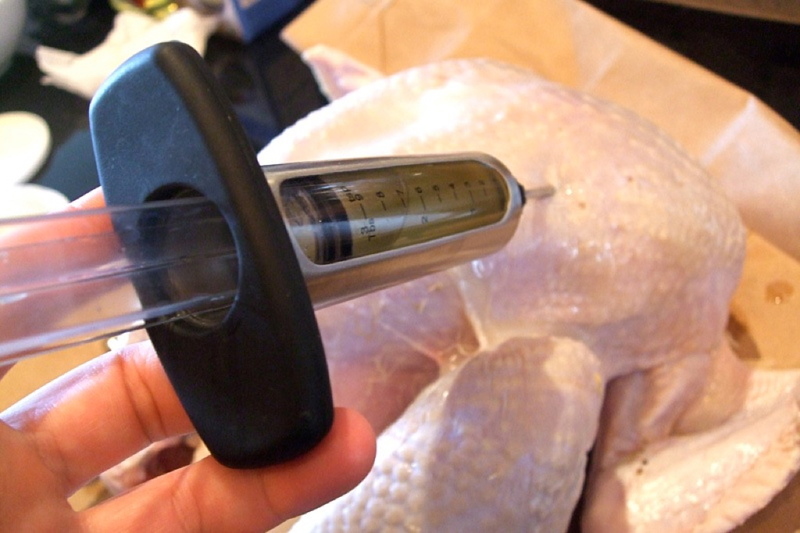 Be careful of the angle of injection, however – last year I had all my friends awaiting my much ballyhooed perfect turkey… we carved off of one side of the breast. Everyone pleasantly enjoyed the bird. Eventually, their eyes betrayed them. “Wait… what’s the big deal here? !” Something was amiss. I knew as well. It was dry. We decided to address the bird. 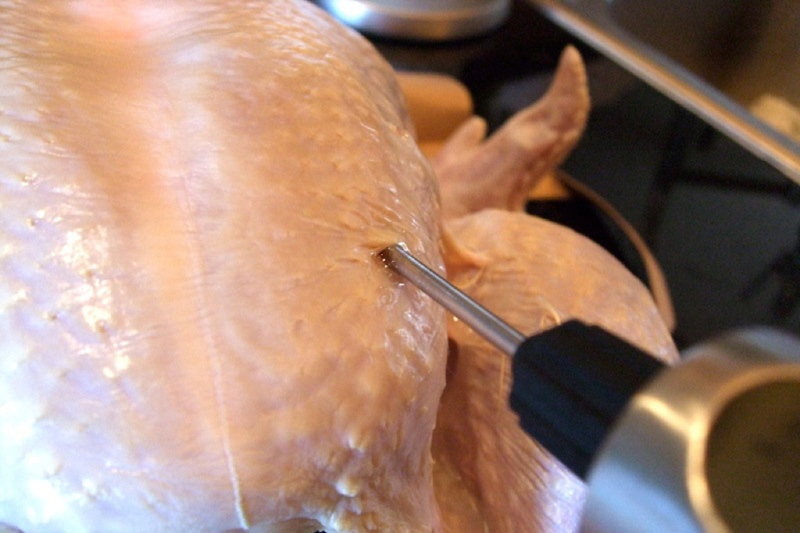 Carving into the other side of the breast – the meat literally gushed with flavorful juices – the intended result. It was obvious that I had injected the offending breast at an angle that not only allowed all the added fat to escape – but the natural juices as well. I forced everyone to eat a piece of the actual “perfect” product – but the moment was lost. Lesson learned. Inject from the top! 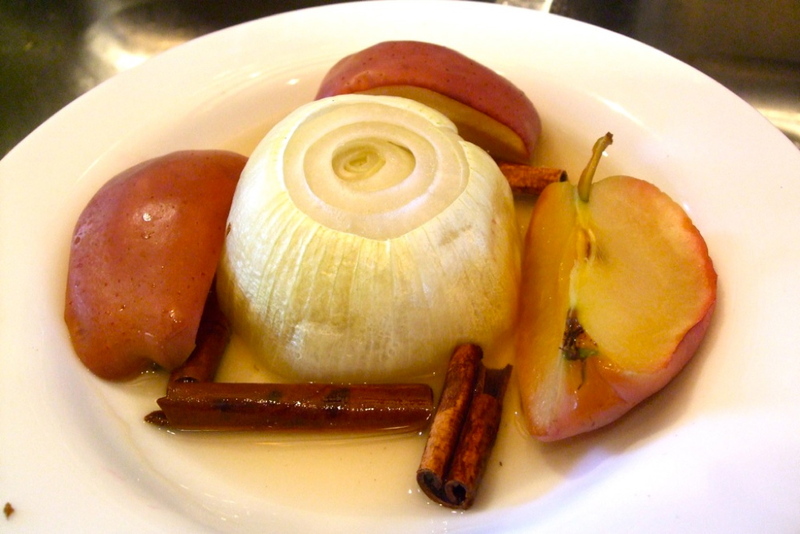 ^ Stuffed with aromatics (Apple, Onion, Cinnamon Stick, Rosemary & Sage). 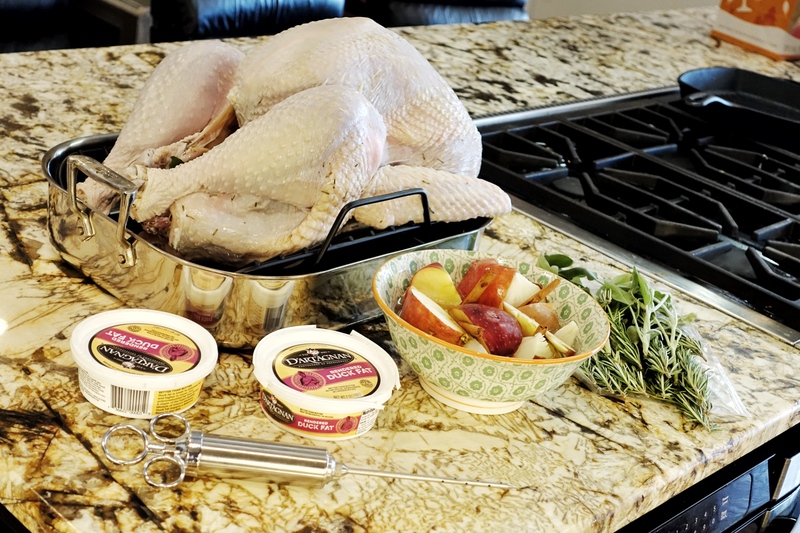 Great for the turkey, but the added bonus here is that your house will smell even more amazing. 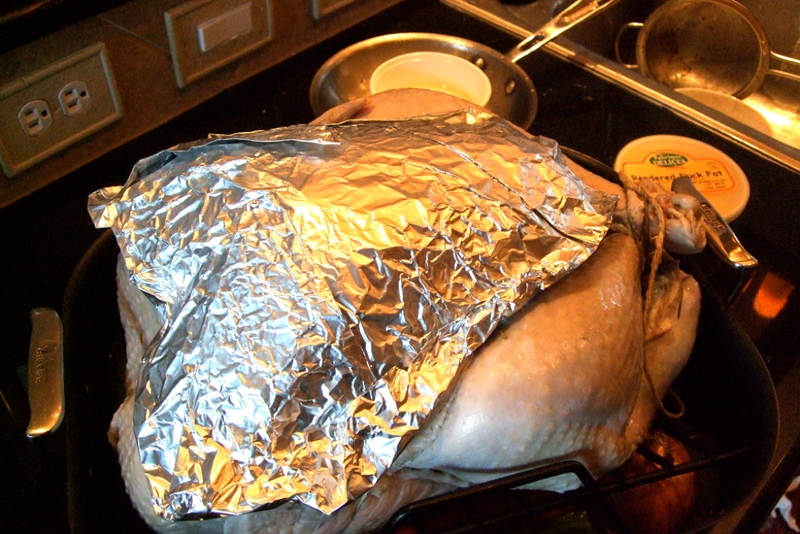 ^ Basically, you form a foil cap over the breast – REMOVING it before you stick it in the oven. …good. 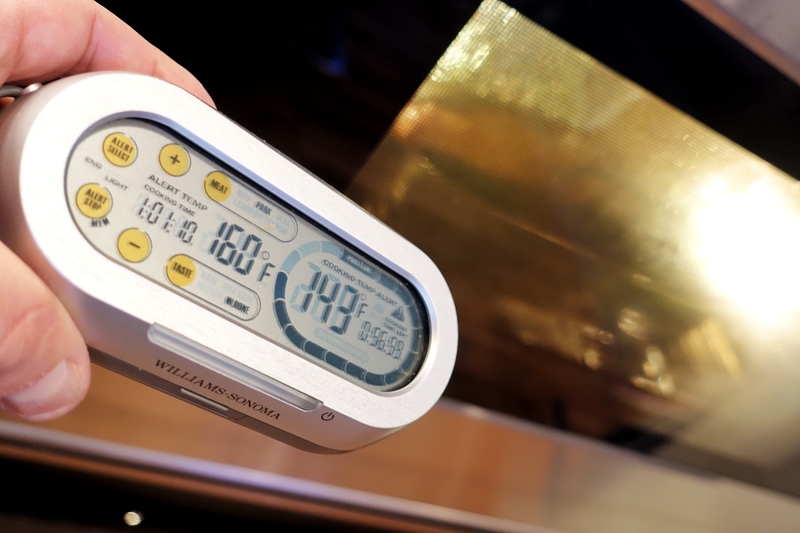 Now put the foil cap back on the breast and back into the oven it goes, (now at 350°) – roast until the internal temp of the thickest part of the breast reads 158° via a remote thermometer. NEVER open the oven door. Ever. 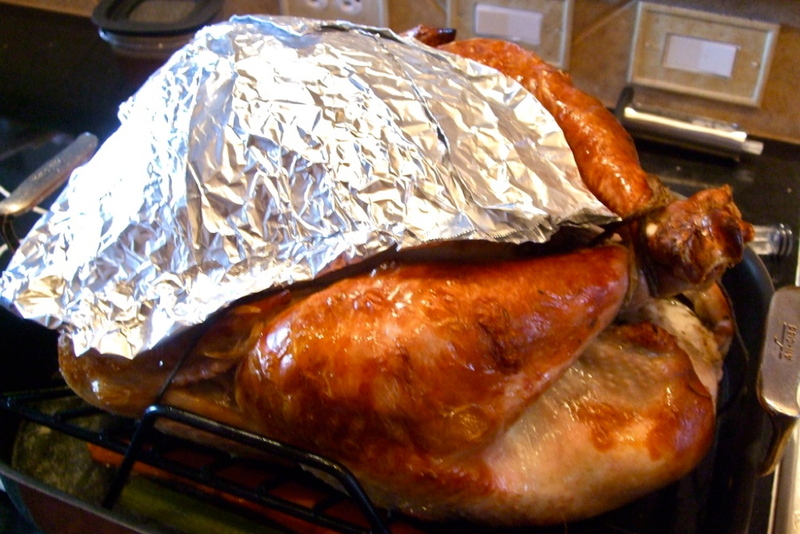 Once 158° temp is reached, pull the bird and let it rest 15-30 mins under a tight foil tent, the bird will continue to cook and bring the internal temp up to 165°. 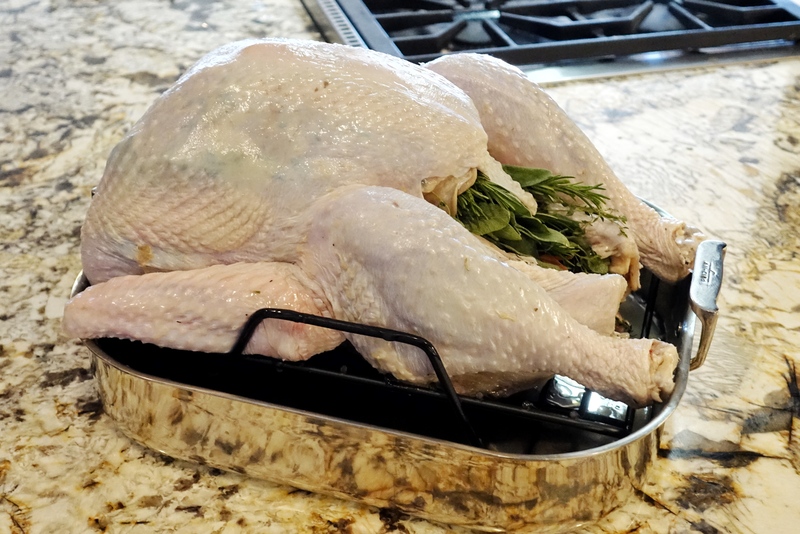 The problem with most turkeys is that they are left in the oven far to long (those little red pop-up things go off at 180° – guaranteeing a terribly dry turkey). 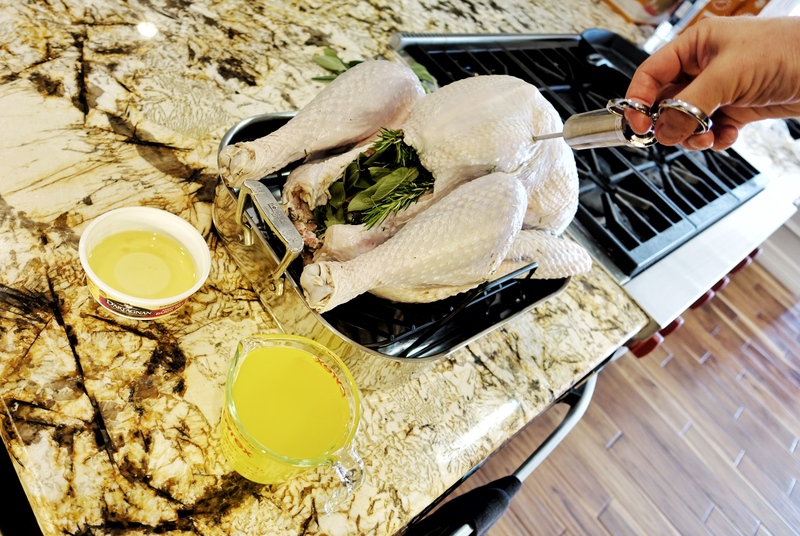 Truth be told – I have pulled larger birds out at 150°, but I know what I’m doing… Use your best judgment – just don’t overcook that sucker! (Lot’s of talk this year (2018) about salmonella – so go ahead and let it have a couple more degrees if you like). ^ And here we go (a 22 pounder; and a 14lb. bird) – it’s unreal. 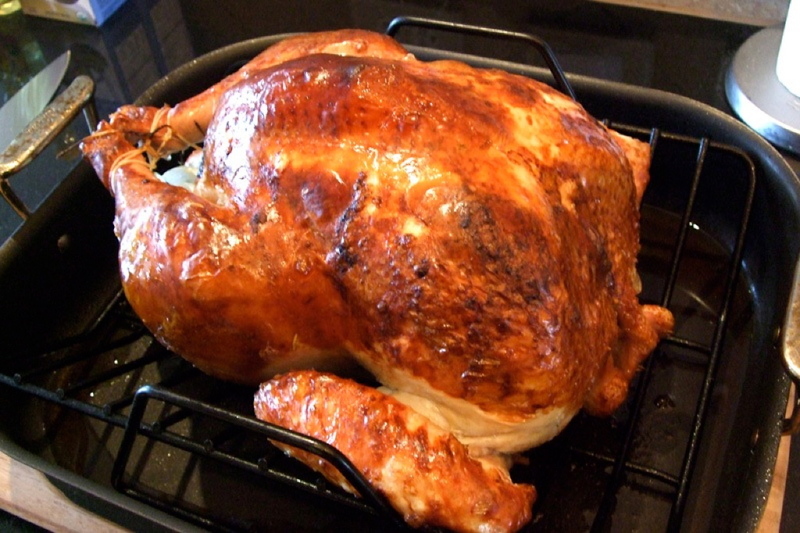 The moistest-est turkey ever. No lie. ^Here’s one from another year. 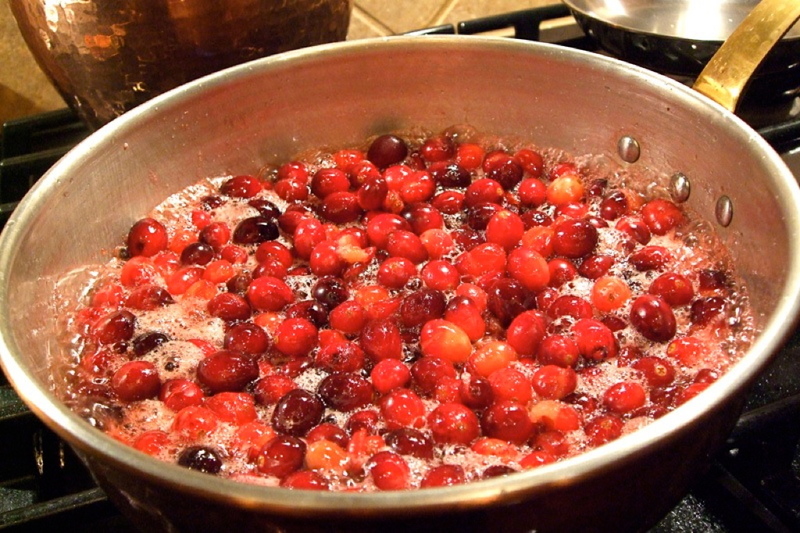 Oh, I also like to make my own Jellied Cranberry Sauce – recipe on the bag, but I pass it through a chinois and get amazing results – even the haters agree! Have at it kids… and again – you were warned. Time again for Stephan Pyles’ Celebrity Chef Dinner benefitting the Stephan Pyles Culinary Scholarship at The Wine & Food Foundation of Texas. Always a great event. It seems like this happens every year, but I was once again chatting up Pyles’ Private Dining Director Lisa Moore over a few glasses of Champagne – and missed taking pics of the hors d’ ourvres by this year’s scholarship recipient, Keith Hildebrandt… sorry dude! ^ Pyles getting his tweet on; ^ Nobu-Dallas exec chef Matt Raso, and exec sushi chef Mitsuhiro Eguchi. ^ The Nobu boys put together Hirame Dry Miso and Tuna Tataki with Cilantro Dressing. ^ Ft. Worth’s Grace exec chef Blaine Staniford prepares Maine Diver Scallop with Sea Urchin, Celery Root and Beech Mushroom. ^ The dish: Duck Cavatelli, Swiss Chard & Shaved Foie Gras. ^ Chef Tim Byres (L) of Smoke plates his sensational Pork Jowl Bacon & Half Sour Cucumber Salad with Sweet Chile, Mustard & Molasses. Stephan Pyles exec chef Matt McCallister and the Portuguese Grilled Cap of Ribeye, Kale-Bacon Fried Cornmeal with Caramelized Pearl Onions and Fall Spiced Apple Chutney. ^ One of my favorite dining rooms. ^ Persimmon Pudding, Brown Butter Chestnut, Membrillo and Citrus-Butternut Squash Spoom by Katherine Clapner, Dude Sweet Chocolate; ^ and a cool shot of Stephan with his former exec chef Tim Byres (L) and outgoing exec Matt McCallister (R). ^Stephan Pyles, Tim Byres, Katherine Clapner, Matt Raso, Jeff Harris, and Blaine Staniford – being auctioned off. The lot was to have them ALL cook at YOUR house – the winners got a steal on this one. There was a good turnout for the event and is was a great night. Matt McCallister will be in the kitchen at Stephan Pyles for about another month – then new adventures await. We look forward to his next venture, and the next chapter at Stephan Pyles! Recently, we took some work newbies out on the town and ended up at El Ranchito in Oak Cliff. I was pleased to take the opportunity to get my Cabrito on! ^ Camerones Cocktail; ^ and the Cabrito en Salsa: Baby goat topped with salsa de tomate. Served with charro beans, rice & pico de gallo. Nice. The place is festive and fun. Be sure to check out the Comida Regional Norteña and De Nuestra Parrilla sections of the menu for the goods. I love the phở and go for lunch at least once a week. Another couple of phởnatics recently came back raving about this place – Pho 2006 on Belt Line east of Josey. I've been back many times – really good broth. Craaazy busy lately. While I work toward posting a ton of new items – enjoy this recent 'omakase' meal at Tei-An. Just some random weeknight. Descriptions seem superfluous. Just go to Tei-An and submit! …I know… I know… Brad at Tei-An – SHOCKER! But, it is so excellent. More variety to come.